Sold & shipped byOh That Tech! Evapolar is a first nanotech personal air cooler allows you to create an own microclimate. 3 in 1 device: cools, humidifies and cleans the air from the dust particles making it healthy. It doesn't take much effort or time for the installation - just pour water into the water tank, plug it and enjoy. 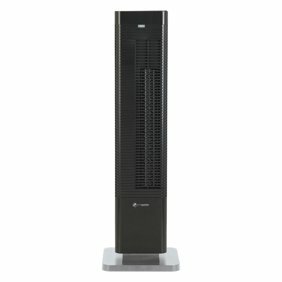 A new smart solution for the market giving a device that actually cools the air within the size and power consumption of a fan. People often can't agree on a regular wall A/C temperature and they have to share it with the whole office: now you can have your personal cooling device. Evapolar automatically creates the most comfortable climate for a person working like your personal small lake that creates a natural breeze, it spreads coolness smoothly the same way air is cooling in nature. Since Evapolar is an evaporative air cooler, it takes hot and dry air and makes it cool and moist. Inside, an innovative fully organic material that inhibits the growth of mould or bacteria. Materials are easily recyclable and don't deal any harm to the environment, doesn't need freon or any other toxic coolant. The most efficient air cooler of this type, no other devices are able to give that cooling performance in such small size. This material is fully biodegradable and, together with low power consumption, makes it green and eco-friendly. LED display shows the temperature of both the incoming and outgoing air. You can also choose a variety of light colors for your water tank lighting to suit your mood. cooling area up to 45 sq. ft.